The AirID2 unites card reader and visual badge holder in one. It secures the data transfer through a 256-bit encryption and connects wirelessly using the Bluetooth low-energy technology with your smartphone, tablet, notebook or PC. This allows now certificate-based login for a wide range of devices. The Bluetooth reader supports end-user devices such as Microsoft Surface as well as Android and iOS based smartphones and tablets. The AirID2 provides a wide range of improved features. Already the popular predecessor model AirID, which Ergonomics has been offering for quite some time, impressed with its large range of functions. Supporting the new Bluetooth Low Energy 4.2 Bluetooth standard (BLE 4.0 at AirID) and an improved B2E SiliconLabs chipset, the AirID2 has a significantly improved B2E connection speed with the usual minimal power consumption. The new AirID2 supports even more different smart card models and can be used with various firmware versions and chip sets. The double-header function provides compatibility with smart cards printed on the chip side. 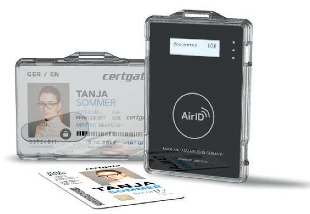 Users also benefit from the even more robust flexibility of the AirID2, which securely stores smart cards with separate TPU protective covers. The protective covers in portrait and landscape format are included. The new AirID2 is certified to CE, FCC and RoHS to meet compliance requirements. In addition, the device is quieter in vibration than the AirID. The LED display has been simplified and shows battery status, power supply and smart card activity. The AirID2 is the only wireless card reader with the German regulatory approval VS-NfD (Verschlusssache, nur für den Dienstgebrauch). The built-in jog dial makes it easy to operate the card reader and adjust settings such as contrast, signal strength and lighting. With a few turns and clicks, the automatic distance logout is easily configured. The AirID should connect automatically? Use the JogDial to select the preferred device. Use the option to configure a work schedule to ensure economical operation and maximum battery life of the device. The AirID2 can be used as in single sign-on scenario for simultaneous login on multiple devices. It provides multi-factor authentication for devices and applications. Mobile employees such as sales staff can use the AirID2 to easily authenticate themselves on the go and access much-needed company data or communicate with colleagues. The Bluetooth smart card reader ensures an automated log-off, if an employee forgets to do so. If the employee leaves the premises, the device logs off due to the Auto-Log-Off feature. For clean room areas such as hospitals, pharmaceutical companies or laboratories, employees can now authenticate contactless. No need to take off the gloves. Employees can use AirID2 to authenticate to multiple cloud services simultaneously. Simple authentication via Bluetooth guarantees secure voice, chat and e-mail communication as well as signing at all times. The secret/private keys are protected at all times because they are not stored on the device itself. Thanks to the Bluetooth connection, your smart card/visual identity card can be used at any time regardless of the device. The NFC function of your smart card remains available, as the smart card remains in the reader. Keep using NFC for logical or physical access. Use an EAL5+ certified smart card for maximum security, even for mobile devices. Of course, certgate has also ensured the best possible compatibility of the device. The Bluetooth smart card reader is for Windows 10, iOS from version 9, Android from version 4.4. and Linux easily installable via driver. Via ONEKEY BRIDGE, the AirID2 can be integrated by CCID into virtually any operating system. It is also compatible with applications such as SecurePIM, cgTunnel and from 2019 also cgPhone. The SDK enables developers with iOS 9+ and Android 4.4 to implement bespoke, customer specific solutions. The new full-scope AirID2 is now available from Ergonomics. By ordering the AirID 2, you will receive two protective covers (1 each in portrait and landscape format), a USB cable, and a clip for attaching to yo-yo or lanyard, in addition to the Bluetooth smart card reader. The included Quick Start Guide will get your AirID 2 up and running in no time. certgate is a leading IT security provider for secure mobile communication technologies and has been a long-time member of the “IT Security Made in Germany” alliance. certgate GmbH is based in Nürnberg, Germany. International leading companies and agencies like the Bundesagentur für Arbeit (Federal Employment Agency) and state security agencies around the world secure their mobile communications with certgate’s patented technologies and products. certgate’s solutions are sold by our partners worldwide, providing true protection against hackers, mobile data leakage and unauthorized access – even by state-sposored agencies. Today, certgate provides sustainable global protection for the mobile communication and data of thousands of users each day.